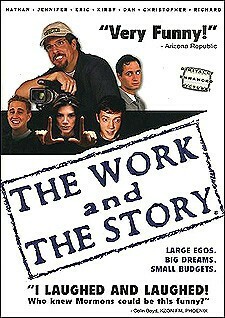 The Work and the Story is a mockumentary of the current state of the LDS film genre. Richard Dutcher (creator of God's Army and Brigham City) is notably regarded as the father of this movement. This fictional comedy has Dutcher missing and presumed dead, and now there's a race for the next "Mormon Spielberg." It was never really clarified why Dutcher was missing, but the point was to document the struggling work of three amateur filmmakers attempting to make the LDS big time: Kevin Evans (Eric Artell), Judy Schumway (Jen Hoskins), and Peter Beuhmann (Nathan Smith Jones). Kevin wants to do wholesome films concerning Book of Mormon stories, but is so concerned about not offending the LDS filmgoer's sensitivities that he produces a battle seen with warrior eggs. So instead of skin, blood and guts, there is simply shell, egg whites and yolk. Judy is an LDS housewife, who is not as sensitive as Kevin is. She wants to make a movie called Bad Girls of the Bible. Peter is the focus of The Work and the Story. This cinematic prima donna is working on a flick called Celestial Match. Any time Dutcher's name is mentioned, Peter becomes quite agitated, and wonders why we just can't move on. Later it is revealed that Peter had some part to play in the disappearance of Dutcher, but what exactly that part was never was specified. The Work and the Story ends on a moral note. Dutcher's vision is to have a wall of LDS films at the local video rental store. So in order to reach this ideal, everyone needs to heed the call summed up in the words of the pre-eminent ethicist of the LA riots fame, Rodney King, "Why can't we all just get along?" This is one of the funnier LDS movies. This is probably due to all the self-deprecating humor throughout the movie. For those non-LDS viewers worried about much of the "in-house" humor, there are at different points in the film various subtitle definitions of certain key LDS terms (e.g., "ward," "bishopric," "outer darkness," etc.). Finally, for more reviews and information on The Work and the Story, click here.